The meaning of its name comes from the Greek word for 'increase', and it is also known by the name Pistacite. 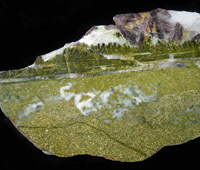 This mineral is the green inclusion in Unakite Jasper. 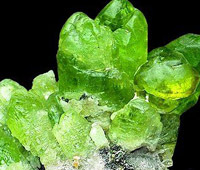 It is found in association with a range of other minerals, including Vesuvianite also known as Idocrase, Garnet, Diopside crystals, Prehnite, Calcite, Albite and Quartz. The commonest color is green, and it may be dark green, yellow green or almost black. The form of the stone varies, with many stones being fibrous or massive, with some occurring as prismatic crystals. 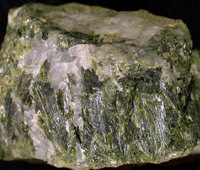 Epidote is a stone that is known to effect different people in different ways. It is also known as Pistacite, and may have a very beneficial effect. It is said to be very helpful to aid prosperity, because as long as you are generous you will manifest more generosity and more prosperity. Epidote has within it an energy that aids you to have the courage to let go of the things that are holding you back from living the life of your dreams. This stone has strong healing qualities, and it may help you to be aware when you need to take rest or when to take better care with your diet. Epidote will help you to feel lighter and freer, and makes it easier to be aware of feelings from the past. This aids you to release both the feelings and the weight. It is a strong healing stone for the emotions, and like all green stones it has a strong resonance within the heart chakra. Its strong vibration will work within all chakras to bring through change. This stone has a positive effect on the health and will aid the immune system and the nervous system. It is said to assist the adrenal glands, the gall bladder, liver, thyroid and the brain. By its energy to uplift you emotionally, it may be possible that this may enable you to both release negative feelings, and to heal associated emotional issues. The stone known as Dream Quartz is Epidote in quartz, which commonly also contains Actinolite, even if it is hard to see, as it occurs as very fine needles in the stone. The combination of quartz with this stone, due to the amplification properties of quartz, helps it to have a stronger action to resonate this combined energy outwards. This stone has been found in a large number of locations, including Mozambique, Pakistan’s Northern Areas and Turang, South Africa, Bulgaria, Norway, Austria, France, Russia, Mexico and the USA. The history of Peridot is intrinsically tied to the tiny Egyptian island of St. John (Zabargad) in the Red Sea, which was the one of the only ancient sources of gem Peridot. This deposit has been totally exhausted, though fairly significant deposits have since been discovered, especially since the 1990's. Peridot is a well-known and ancient gemstone, with jewellery pieces dating all the way back to the Pharaohs in Egypt. The gem variety of the mineral Olivine, it makes a lovely light green to olive-green gemstone. The intensity of color depends on the amount of iron present in a Peridot's chemical structure; the more iron it contains the deeper green it will be. The most desirable colour of Peridot is deep olive-green with a slight yellowish tint. Deeper olive-green tones tend to be more valuable than lighter colored greens and yellowish-greens. Though pretty and popular, Peridot is not a very durable gemstone. It has a lower hardness than many gemstones and is more prone to scratches, and has a tendency to occasionally burst under great stress. Peridot also cannot stand intense heat or rapid temperature changes. Peridot can also chip if banged hard, and should never be steam cleaned or cleaned with ultrasonics. Much gem Peridot comes from igneous environments. These gems are formed deep within the mantle of the earth, and are brought the the surface by volcanic activity. Peridot is also found in certain types of meteorites, though these forms of Peridot are too rare and usually too small to be used as gemstones. Peridot is both a day stone and a night stone, keeping its shining color even under artificial lighting. For this reason, it is sometimes called "Evening Emerald". Although Peridot can be pronounced both with and without the "t" at the end, most professionals in the gem trade pronounce the "t". Findings of large transparent Peridot from Burma (Myanmar), China, Afghanistan, and especially Pakistan’s Hazara and Kohistan have provided a new quality of Peridot unlike anything else previously discovered, with large, nearly flawless crystals that are well-suited for gemstones. The new discoveries are responsible for a reawakened interest in this gemstone. However, the most significant producer of gem Peridot remains the San Carlos Reservation of Arizona. 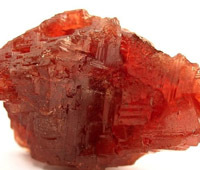 Garnet is not a single mineral, but describes a group of several closely related minerals. Garnets come in a variety of colours and have many different varieties. However, the most widely-known colour of Garnet gemstones is dark red. When the term "Garnet" is used, it is usually connotative of the dark red form; other colour Garnets are usually given more descriptive gemstone terms. 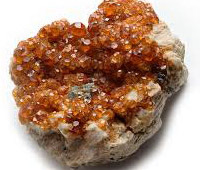 Spessartite is an orange to orange-red form of Garnet, and has recently increased in popularity, with several new deposits of gem grade material having been recently exploited. 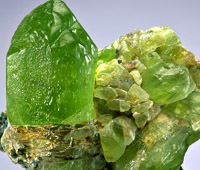 Grossular, the most varicolored form of Garnet, has the important gem variety of green Tsavorite, as well as orange-brown Hessonite and a yellow to yellow-green form. 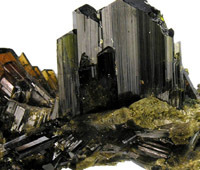 Andradite, the most lustrous of the Garnets, has the rare green Demantoid variety, the yellow Topazolite variety, and the black Melanite variety. 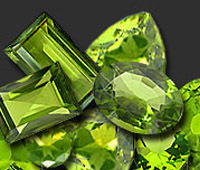 Uvarovite, the rarest of the familiar garnets, is seldom found in crystals large enough to be faceted, and is the least represented of all the familiar Garnets. Garnet is a very popular gemstone, and is the most well-known dark red gemstone. Red Garnet gemstones (Almandine and Pyrope) are very affordable and faceted into all types of jewerly, including necklaces, rings, bracelets, and earrings. Round cabochons of red Garnet are also popular and used in rings and bracelets. The variety Rhodolite has become a very important jewelry gemstone, and the rare green Tsavorite and Demantoid Garnets make exquisite and costly gemstones. Colour Changing Garnet has sparked recent interest, and it is most often used in rings. 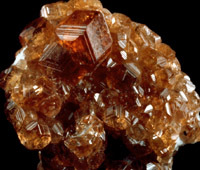 Other forms of Garnets such as orange Spessartite, yellow Grossular and black Melanite are also used as gemstones. Its sources are found in Pakistan’s Chitral, Dir, Swat, WQuetta, Kalat and Malakand.